It’s official… I now have everything that I need to own a horse. Technically. I learned this weekend that there is so much amazing stuff out there… it could be very easy to spend TONS of money on horse gear! This weekend I bought my very first saddle! My trainer hauled Sue down to the Rancho Murieta Equestrian Center, where a cutting show was being held. I have been riding in one of her saddles that I absolutely love, made by Roohide Saddlery. John, the owner and saddle maker spent lots of time with Sue, trying different trees (that’s the shape/form of the saddle) on him to make sure we got a good fit that allowed his gait to be free. After sitting on what felt like a thousand different saddles (it was actually about 40) and trying a few out (who knew that’s how you picked a saddle), I finally found one I liked. 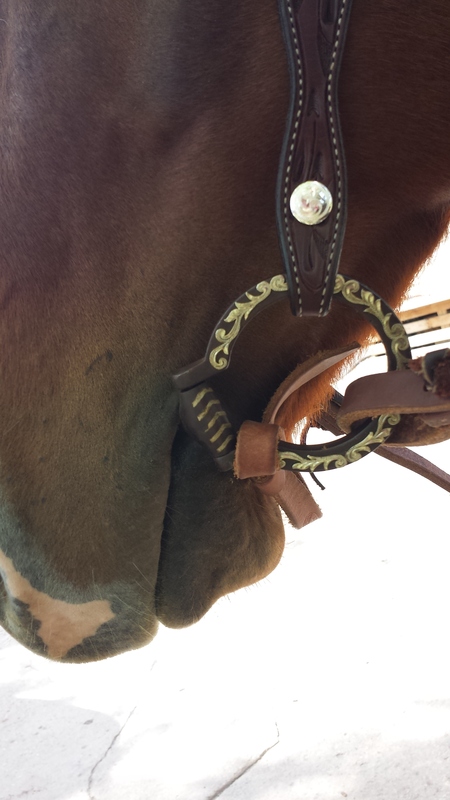 I honestly could not have asked for a better saddle… it’s like he custom made it for me! I absolutely love it – the skirt and gullet have rough out leather, which is basically a roughed up version of the leather on the rest of the saddle. The edges all have barbed wire tooling – nice and manly for my Boy Named Sue! I left it overnight because John wanted to do some customizing on the stirrups (since I have seriously short legs he wanted to change up the length so that I had more holes – ie. could raise them higher if needed). I rode on it this afternoon and it was beyond comfortable! When I went back today, my parents met up with me to watch some of the cutting competition. Cutting is basically a judged version of separating or “cutting” one cow from the herd and keeping him there. It’s so interesting to see the different techniques and the level of discipline the horses have! 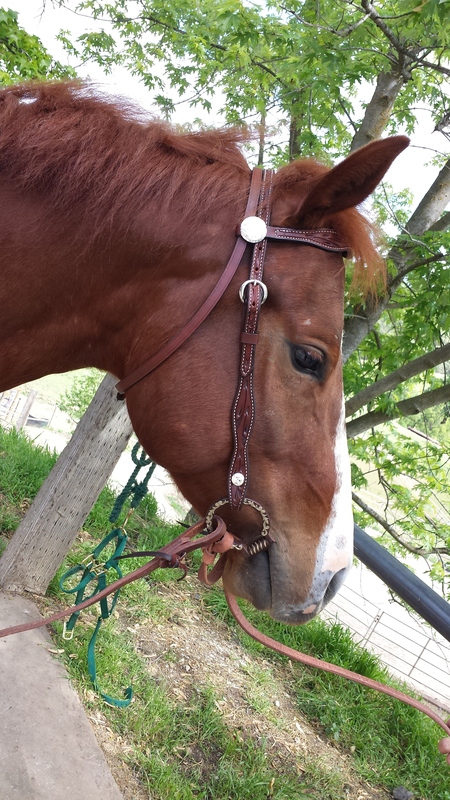 My parents were awesome and decided to buy me the last piece of tack I needed – the headstall (when put together with reins and a bit, it becomes the bridle). 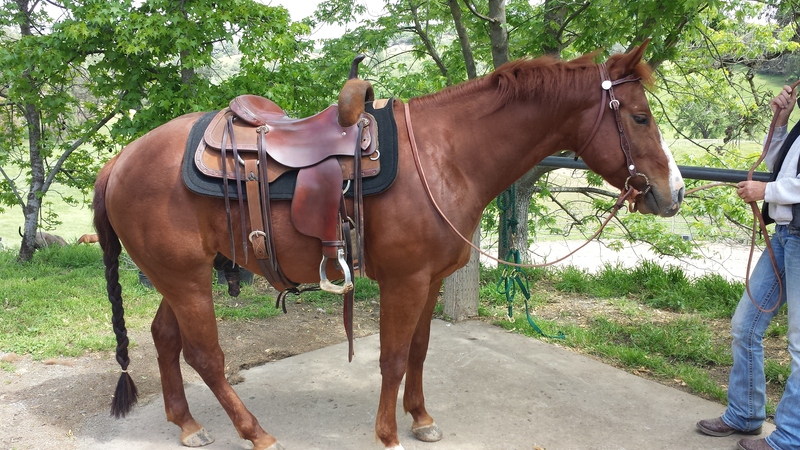 Since I had my saddle there, we were able to match the leather. I absolutely love it – the tooling is arrows, which goes well with the barbed wire on my saddle! Here’s the bit I got from my trainer… I love the silver detail on it! Now it’s time to break it all in… tonight’s project is to sit on my sofa and bend and smush my reins… the softer and more “broken in” the leather is, the better! I am one happy, tired cowgirl!